On April 22, 1881 William Belden purchased the four-story brownstone mansion at the northeast corner of Fifth Avenue and 62nd Street from George W. Tucker. He paid the equivalent of $3 million today for the 25-foot wide residence. A near copy of its neighbor next door, it featured Italianate details like the columned portico atop the high stoop, triangular pediments above the parlor floor windows, and an elaborate cornice. But it was not enough for Belden. Three months later architect George A. Freeman filed plans for extensive alterations, including a fifth floor in the form of a stylish mansard, a bay window facing Fifth Avenue on the second floor, and a rearrangement of the basement floor plan. While that work was ongoing, Belden had a pipe organ installed, constructed by J. H. & C. S. Odell & Company. It was a pioneering move and by the end of the century pipe organs were de rigueur in the mansions of Manhattan's affluent. The millionaire financier was spending liberally, despite his ongoing legal problems. His name would be forever tainted after he and his former partner in Belden & Fisk, Jim Fisk, along with Jay Gould had been responsible for the stock market crash of "Black Friday," September 24, 1869. Their contrived inflation of gold prices resulted in thousand of people losing their life savings. Belden's firm by now had been reorganized as William Belden & Co., but his legal woes continued. Aside from the suits relating to the stock market debacle, Belden repeatedly found himself in court for a far different reason--his steam-powered yacht the Yosemite. The same year he purchased the Fifth Avenue mansion he was sued by crew members for an aborted voyage. Belden had contracted mate Edward Marsland and William H. Phillips at $70 a month ad $80 per month, respectively, for a six month trip. The men reported to the yacht on February 1, 1881, and prepared the vessel for sailing. On February 12 Belden fired them "without any cause," according to them. On February 21 they filed suit for the full wages of the contract. Two years later Belden hired Andrew Reed to make repairs on the Yosemite. The New York Times described him as "an athletic boss ship carpenter." But after the work was done, Reed was having trouble getting paid. On June 6, 1883 The Times reported "Finally he went to Mr. Belden's house with a bill." Belden was inside meeting with William F. Sales at the time. The Times reported "Mr. Belden met him in the hallway and told him gruffly that he knew nothing about him, as he had never ordered him to do any work on the Yosemite." Reed began to present the invoice, but Belden said he was not interested in seeing it. The shipwright boldly asked him what he had done with the bill he previously had given to Mrs. Belden. "I want none of your impudence," snapped Belden, and then tried to physically oust him from the house. The newspaper quipped "He must have found the job too onerous, for, according to Mr. Reed, he called another person to help him." Sales and Belden "put Mr. Reed into the street, and then Mr. Belden kicked him." During Reed's courtroom testimony on June 5, Belden burst out "that vagabond!" Reed presented his crushed hat as evidence of the affray. 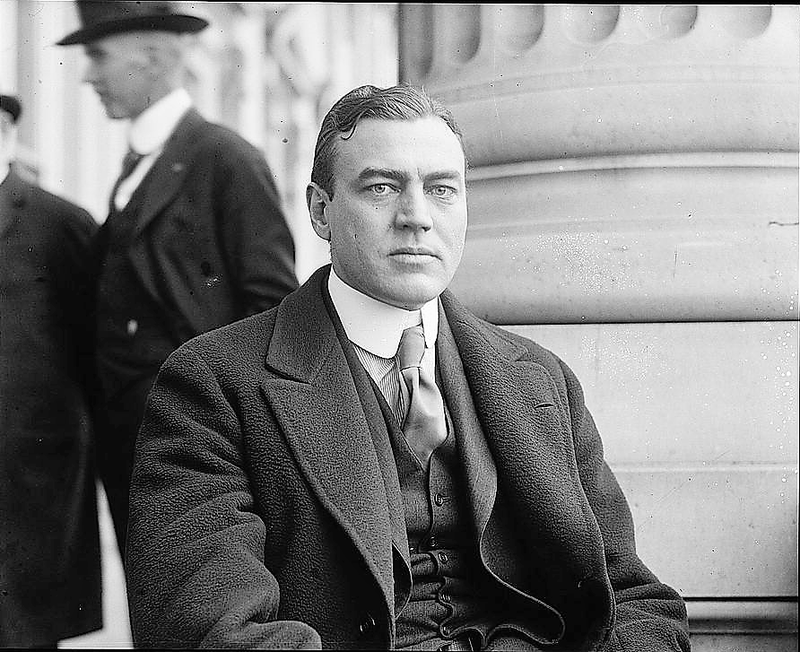 Belden testified that Reed "was boisterous" and refused to let him see the bill and "declared that he would not leave the house until the sum he said was due him was paid." William Sales corroborated Belden's story. Andrew Reed's suit for $2,500 damages went to the jury. A more intimidating adversary in court the following year was Cornelius Vanderbilt. In July, 1882 the Yosemite ran into the steam yacht Charlotte Vanderbilt, sinking her. Vanderbilt sued Belden for damages in 1884. Although the jury awarded the multi-millionaire only $13,000 of the $36,000 he sought; it was not an insignificant amount, amounting to a third of a million dollars today. Although How to Know New York City put a positive spin on things in 1887, saying "At No. 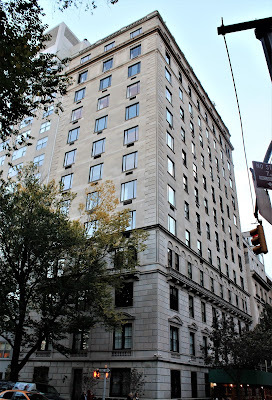 810, corner of East 62d Street, is the town-house of William Belden, a many-millionaire, who defeated Jay Gould in the famous Black-Friday financial battle," in fact years of legal battles and business problems (he was called "disreputable" by many) were draining Belden's coffers. Possibly to stave off foreclosure, Belden ceded his prized pipe organ to the Troy Savings Bank in 1889. Then, on April 1 that year he signed over title to Margaret S. E. Cameron, daughter of Sir Roderick W. Cameron, for $109,000. Margaret's ownership was brief. She sold mansion to the wealthy, unmarried sisters Matilda W. and Catherine Wolfe Bruce in November 1893 for $205,000--more than $5.75 million today and nearly twice the amount Margaret had paid. The women were the daughters of George Bruce, a Scotsman who had arrived in the United States before he was 15-years-old. He became a successful typefounder and inventor of printing machinery. He left his daughters a substantial fortune. Their summer estate was at Mamaroneck, in Westchester County, New York. Both Matilda and Catherine were well-known for their philanthropies before moving into the Fifth Avenue mansion. In 1877, for instance, Catherine had contributed $50,000 for the construction of the George Bruce Library on 42nd Street; and she was highly involved in financing the erection of the New-York Historical Society building in 1891. Matilda was no less generous. On January 5, 1895 the Real Estate Record & Guide reported that she and Mrs. Joseph M. White had paid for the construction of the Sullivan Street School. George Bruce had also left his daughters extensive real estate holdings. William L. Keese had been his trusted manager and the women not only kept him on to handle the estate, but established an office for him in the basement level of the mansion. Wealthy and respected in his own right, he had written several books, including the Life of John Keese and the Life of William E. Burton. Catherine died in the mansion on March 13, 1900. In reporting on her death The New York Times mentioned "Miss Bruce was the donor of a fund to the Astronomical Society of the Pacific which is devoted to the presentation annually of a gold medal to some astronomer for distinguished service to the science." Matilda remained in the house, continuing her philanthropies and real estate dealings, erecting several downtown buildings. Matilda Wolfe Bruce was at the Mamaroneck estate when she died on July 27, 1908. The New-York Tribune reminded its readers that she "was related to the Lorillard family" and said her New York real estate holdings alone were valued at about $3 million. The New York Times said she had died "from the debilities of age." Ironically, just two days later at around 3:00 in the afternoon a maid was in William Keese's office in the Fifth Avenue mansion when the elderly man collapsed. She called for help and he was carried to a couch, but died within a short time. The next day Matilda's funeral was held in the mansion. The Times called her "one of the city's philanthropists. She was a frequent giver to the Museum of Natural History, the Metropolitan Museum, and Bronx Park." The property values in the Fifth Avenue neighborhood had continued to rise. When Gustav Amsinck purchased No. 810 on January 14 the following year, he paid $500,000, nearly $14 million today. But while the price had improved, the architectural style had declined. Within three weeks his architects filed plans "for making over the front of the four story and basement dwelling house...into an American basement dwelling house, with a central vestibuled entrance," as described by the New-York Tribune on February 18. The alterations brought the entrance to sidewalk level and reconfigured the basement and parlor floor plans. Amsinck was the head of Amsinck & Co., described as "one of the leading New York firms engaged in the South American trade." He had remained a bachelor until 1905 when he married Florence Delaplaine Beeckman, the widow of James Hude Beekman. The groom was 68-years-old and the bride 56. Florence had only been a widow for three years when she married Amsinck. She would be widowed again almost immediately upon moving into the remodeled Fifth Avenue mansion. Gustav Amsinck died on June 8, 1909 just five months after taking title to the property. In April 1910 Munsey's Magazine noted that Florence had been "taxed on one million dollars in personal property" and noted "By her husband's will, Mrs. Amsinck received all his real estate in this country, in Germany, and in Italy, as well as much other property. She is probably worth to-day twenty million dollars." As had earlier been the case, Florence would not remain widowed for a very long time. On June 2, 1912 The New York Times announced "Mrs. Gustav Amsinck will be married to Hamilton Fish on Tuesday, June 25, the ceremony to be solemnized at the home of the bride." It appears that Florence fibbed on the married license. According to The Times on June 14 it stated that Fish "was sixty-three years old, a lawyer, and that his was his second marriage, his first wife having died many years ago. Mrs. Amsinck gave her age as fifty-seven." She was, in fact, 63. Florence had risen to the top of the social heap with this match. Fish was the son of Hamilton Fish and a brother of Stuyvesant Fish. 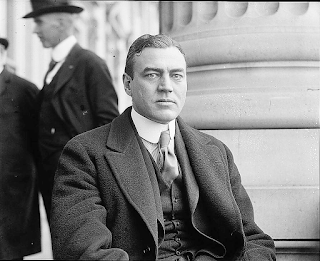 A former Congressman, he had also been Speaker of the Assembly and Assistant Treasurer of the United States. The could were married in No. 810 Fifth Avenue on June 25, 1912. The Sun reported "The ceremony took place in the drawing room, which was decorated with palms and potted ferns. There was a bower of white roses and lilies arranged at one end of the drawing room and beneath this there was a temporary altar." Music was provided by a "Neapolitan orchestra" which was hidden "behind a screen of oak leaves and rambler roses." The article noted that the newlyweds left for an automobile trip to the Berkshires, and would sail for Europe on July 11. There they "will spend a part of the summer in Italy at the Villa Amsinck, at San Giovanni de Ballagio." 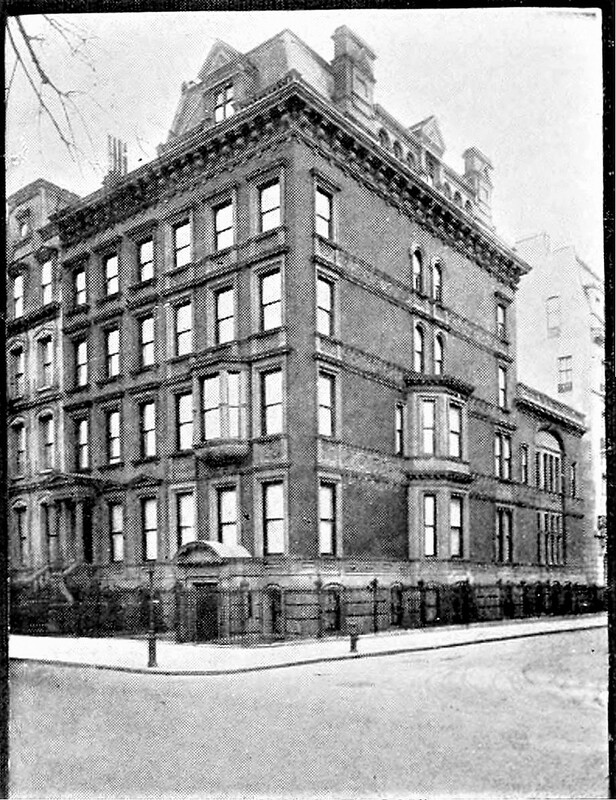 Florence and Hamilton shared homes--they wintered in the Fifth Avenue house and summered at his estate, Rocklawn, at Garrison, New York. The couple routinely appeared in society columns for their entertainments and travels. But in the spring of 1920 their names moved to the front pages. In December 1919 a "houseman" named Joseph Fried was hired. He duties included tending the furnace, washing widows, cleaning the sidewalks and such. Immediately the handyman did his best to make friends with the Fishes' German Shepard, named Luchs. He had been a gift to Fish about four years earlier. Fried went so far as to ask to be allowed to take Luchs for his daily walks to gain the dog's trust. But according other servants, "the dog never would take to him." Hamilton Fish from the collection of the Library of Congress. Hamilton and Florence took Luchs with them when they left for a weekend at Rocklawn on Saturday, April 19, 1920. When they returned at around midnight on Sunday, Florence went to her bedroom to remove her jewelry. She discovered that her jewelry case containing a reported $75,000 in jewels was missing, as was Joseph Fried. Servants insisted to detectives that Fried had tried to make friends with Luchs so the dog would not interfere with his felonious plans. But Luchs was a better judge of character. So when the Fishes took him on their first trip of the year to Rocklawn, it gave Fried an opportunity and he took it. Despite the loss of what was described as "jewels and valuable trinkets, many of them heirlooms from her former husband, the late Gustave [sic] Amsinck," Florence remained unexpectedly calm. After a reporter from the New York Herald arrived the following morning he reported "Mrs. Fish was at home...but was too busy entertaining guests to discuss the robbery." It was not until Fried's capture in June that it was discovered he had made off with more than Florence's jewelry. Although Prohibition had been enacted in 1919, private citizens were permitted to retain their own stock of wine and alcohol purchased prior to the law. The Fish cellar was well stocked and throughout his five-month's employment, Fried confessed that "he emptied the contents of hundreds of cases of Scotch whisky into cans, refilled the empty bottles with water and nailed down the cases," according to the New-York Tribune on June 4, 1920. The lost liquor was valued at $10,000--nearly $125,000 today. The brownstone mansion was decidedly out of fashion at the time. Less than two years later, on January 20, 1922, the New-York Tribune reported that Florence had hired the architectural firm of Hoffman & Hoffman to design a 12-story apartment building on the site of the vintage structure. The architects placed the cost of the project at $800,000; more than $11.7 million today. The Fishes, however, seem to have been reluctant to move on. In March Florence was conducting Lenten sewing classes in the house for the benefit of the New York Nursery and Child's Hospital. And in January 1923 Elizabeth Stuyvesant Fish, the infant daughter of Hamilton Fish, Jr., was christened here. It was not until 1925 that the mansion was demolished and the apartment house was begun. Upon the building's completion in 1926 the Fishes moved in (the architect had in the meantime been changed to J. E. R. Carpenter). Florence died shortly thereafter on October 22, 1926 at the age of 77.